In 1941, aged 12, Helga Weiss and her parents were interned in the Nazi concentration camp of Terezin. Here she began to document her experiences in a diary. Three years later, they were sent to Auschwitz. Forced to abandon all of her belongings, Helga hid the diary in a wall. Helga was one of only a hundred who survived. When she finally returned home, she managed to retrieve her diary'The most moving Holocaust diary published since Anne Frank' Daily Telegraph First they led us to the baths, where they took from us everything we still had. Quite literally there wasn't even a hair left. I didn't even recognize my own mother till I heard her voice . . .In 1941, aged 12, Helga Weiss, her mother and father were forced to say goodbye to their home, their relatives and all that they knew, and were interned in the Nazi concentration camp of Terezín. 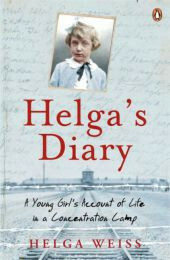 For the next three years, Helga documented her experiences there, and those of her friends and family, in a diary. Then they were sent to Auschwitz, and the diary was left behind, hidden in a wall.Helga was one of a tiny number of Jewish children from Prague to survive the holocaust. After she returned home, she eventually managed to retrieve her diary and completed the journal of her experiences.